Extremely nimble servers & super fast response times. Uptime isn't a concern. Downtimes are rare. Responsive support, beginner-friendly and efficient. Quite cheap, considering the performance. Hostinger is one of the largest independent web hosts, i.e. they're not owned by a huge parent organization like EIG (which owns BlueHost, HostGator, and hundreds of others). Though they haven't had the financial backing of a conglomerate, their bootstrapped growth since 2004 is impressive. They currently host close to 25 million websites, and gain an average of 20,000 new users every single day. Amazed by these intriguing numbers, I decided to give their shared hosting a try, and went with their 'Business Shared Hosting' plan. Here's my detailed review of Hostinger. Performance is AWESOME on Hostinger. It surprised me a lot, because they brand themselves as a cheap web host. And any experienced web hosting user would tell you that good performance is not something you can usually expect from cheap hosts. So, Hostinger is a big exception to this generalization. Now, the test site was fairly lightweight (it was running GeneratePress, and having just a few images on the homepage). But, still a 263 ms load time is beyond impressive for a WordPress site on any host, let alone an affordable shared host. An image-heavy blog post loading at under 300ms on a cheap shared host - stuff of dreams, isn't it? Honestly, I haven't been hosting with them long enough to provide a useful insight into their average uptime. Though, I'm yet to face any prolonged downtime other than one or two occasional alerts from Uptime Robot (my preferred uptime monitoring tool), none of which lasted more than 2 minutes. There's also the industry-standard 99.9% uptime guarantee to give you some more peace of mind. They also maintain a dedicated server status page, which currently indicates that average uptime for last 30 days across all their servers was 99.956%, which isn't bad, considering they have hundreds of servers. Overall, uptime shouldn't be a major concern, because in my experience, hosts that regularly struggle with uptime, show such symptoms very frequently, so one can get a hint even in 1 week of hosting with such a host. Hostinger haven't seemed like such a host to me. They have a fantastic knowledgebase containing the answers to the most common questions, and solutions to the most common issues. If their knowledgebase was unable to provide you with an instant solution, their beginner-friendly support team would have your back fairly quickly for common issues. Unlike their peers, say iPage or any other EIG-owned host, their customer support is actually pretty responsive and genuinely helpful. They offer the standard email/ticket support, along with 24x7 live chat support, but lack phone support. The lack of phone support shouldn't be a deal-breaker for most people. But their email/ticket or live chat support should be adequate as the initial-response time is less than 2 minutes on average, and I didn't face any queues in live chat. You get all basic queries solved almost instantaneously. 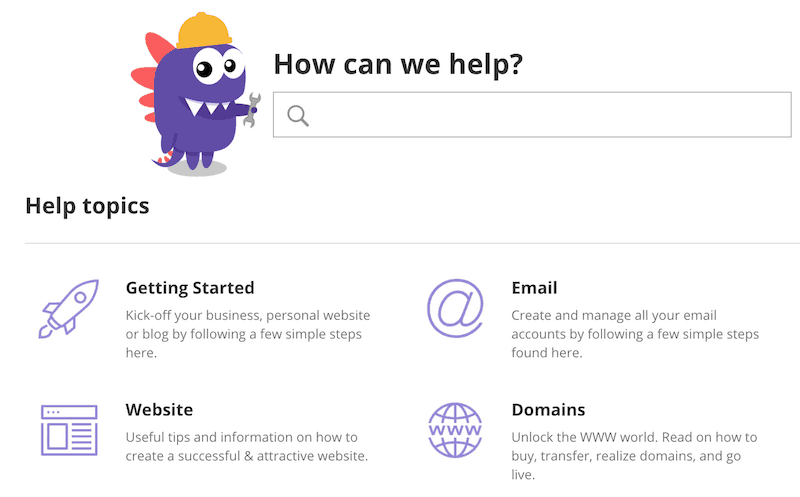 Especially, if you're just getting started with websites, you'll find their support very apt. But, throw anything a bit too advanced, and it may take a bit longer to get a satisfactory answer or solution. Although, it's worth noting that I didn't try their priority support (which they upsell at $7.99/mo). 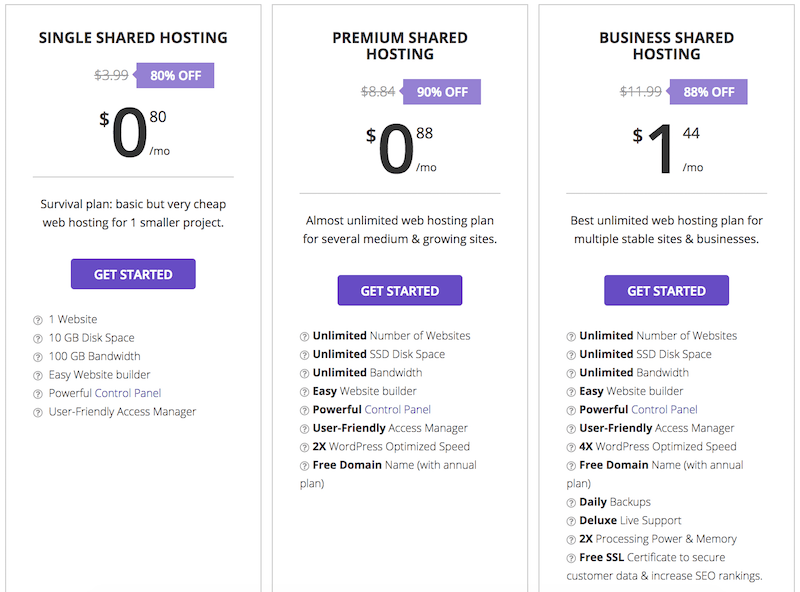 I felt it was kind of pointless because most people belonging to their target market (people looking for a cheap host) are unlikely to pay as much as their hosting plan itself on support. The number of websites you can host on them, and the amount of disk space and bandwidth you get. Daily backup as opposed to weekly (for the business shared plan). Free SSL certificate (for the business shared plan). 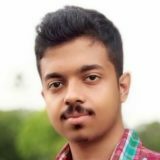 The single plan is a great, affordable option for hosting a single small site, whereas the costlier plans are ideal if you have several sites to host. One thing I should note is that their minimum billing period is 3 months (so no monthly payments). They lack LetsEncrypt's Free SSLs, meaning you need to pay for SSL certs unless you're on their higher-end business shared plan. Lifetime SSL certs for a $9.99 one-time fee. Daily backups for $1.29/mo (else you get free weekly backups with the single and premium plans). CloudFlare for a $5 one-time fee (which you should be able to setup for FREE yourself anyway). Priority support for $7.99/mo (which is kind of pointless for the lower plans whose target audience is looking for very cheap hosting). Though their overall UI is very easy to understand and use, their control panel (they call it hPanel) doesn't exactly look like the default cPanel skin that everyone has grown used to. It has nothing but basic options and overall functionality. While this is a good thing for beginners in a way, experienced users may not like this slight lack of flexibility. Hostinger isn't one of those hosts that only support card payments. They not only support PayPal, they even support Bitcoin payments. Their script auto-installer features over 50 different popular web softwares like WordPress, Drupal, Joomla and more. I only tried auto-installing WordPress, and the process was swift, smooth and effortless. Overall, Hostinger is a solid option for beginners who aren't willing to shell out a lot of money towards web hosting. 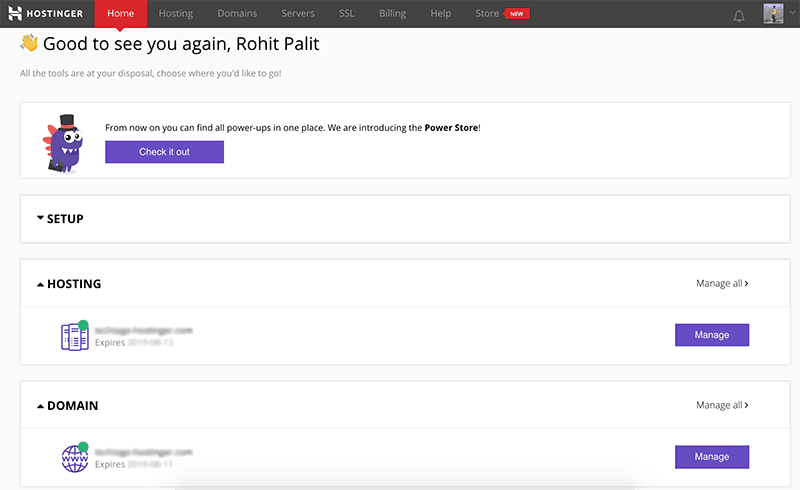 In the budget shared hosting space, I'll recommend Hostinger over many of the more popular ones like iPage. Especially, the performance that they offer for the price is incredible. With uptime not being a cause for concern either, you could only complain about the lack of phone support, if you must. There are quite a few upsells, as is expected from any cheap host (they need to make money too, after all). So, if you're not a big fan of upsells, you can consider this as a con. But then again, that'd be cherrypicking considering they're a budget host. With that being said, they offer a 30-days risk-free trial program, and a no questions asked money back guarantee, so it's worth giving them a try if you're in the market for a budget shared host. Overall, Hostinger is a solid option for beginners looking for a fast, affordable and reliable web host.